So, Wang Chung wasn't on last night's Hit Me Baby One More Time. They get to suffer in the grand finale next week. 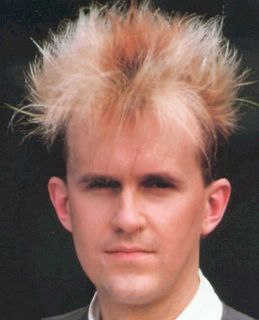 As if that wasn't bad enough, I was horrified to hear that another great performer of the '80's - another one I really like and even saw in concert three times - is up on the NBC humiliation block next Thursday: Howard Jones. Lord, that is so sad. HoJo was no one-hit wonder! He kicked the charts hard '83-'85. And, HoJo has always seemed like such a nice guy. I remember hearing his mom ran his fan club and she sold t-shirts and stuff at concerts. (How sweet is that?) But I guess his following has diminished and his sales slowed considerably since the old days. I see on his website that he's selling a bunch of his stuff on eBay. Yikes. Major bummer. Aaaaah, I am torn. Torn, I tell you! Damn you, NBC! Damn you and your crappy summer crap! I am glad that I am not watching this show. I would be lying if I said it didn't initially peak my curiousity. Who isn't sentimental about their youth and artists that performed the "soundtrack" to it? I just couldn't stand to see these 'people of my past' battling it out in the usual ugly "American Idol" fashion. Ultimately, I would be the bruised victim... as if there isn't enough proof already that I am a spent human, middle-aged and growing older by the minute. "You're older than you've ever been. This day will soon be at an end and now it's even sooner. And now it's even sooner. And now you're older still."